In this part of my WordPress Theme Tutorial I fix all of the CSS for the main blog page. I layout the sidebars and fix up any errors that may have come out while making this theme. 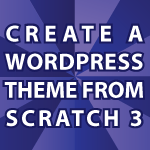 All of the code from this tutorial is available in part 1 of this tutorial here Create a WordPress Theme. You can use the code however you’d like. Feel free to also download the theme. It is free to use as well. Derek, Great contribution I must say you have made… to most people… Stay blessed and keep helping. Thank you for the compliment 🙂 Send me the url and I can easily figure out what is wrong.